If you’re looking for a complete system that goes step by step through the process of creating a money system for your kids, then this is your book. It takes a lot of diligence, and you may have to take some notes, but the MoneySmart Family System is the total package. 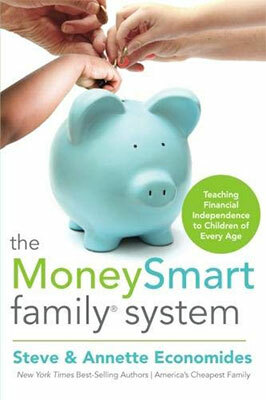 While the authors cover all the basics like college, insurance, and teen jobs, they also dive into topics that you won’t find in many other books on children’s finances, such as extra curricular activities, a complete system for paying your children, and how grandparents can help teach money skills. The book really leaves nothing unexplored. The Economides, also known as “America’s cheapest family,” have been writing on children’s finances for years, and they have a few other books on cutting expenses and living frugally. I think I have a soft spot for their family since they have five kids, and I know what it’s like to be frugal with five kids. While I’m not sure I would like to be known as a “cheap” family, I understand what they’re going for, and our family follows most of their ideas.